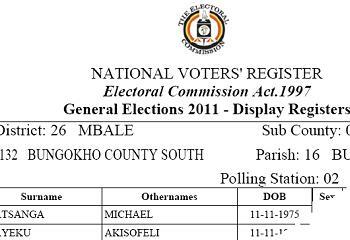 The National Voters Register is now online through the Electoral Commission website www.ec.or.ug which can help the public in identifying any errors omissions and also notifying the commission on all those who may have died so that the appropriate changes can be made. The service has amused many Ugandans who have tried using it though like any new service, it came with its shortfalls that have to be addressed at the earliest. To get the required results, you must have your card on you or better still you must know the county, parish, village and so on before you can tell that you are there or not. If you simply entered your name and carried out the search, it service would return zero results however if all the fields like mentioned above are listed, then results will show shortly in a Portable Document Format otherwise known as (PDF). The move will go along way in addressing some of the issues that have been faced with the previous elections.